Austin Metro City X Red & White Circular Stickers. 48mm Pair. Austin Rover Supercover Sticker. 3.5". Austin Rover Translucent Headlight Stickers. 7.5" or 11"" Pair. British Leyland Austin Morris Jaguar Rover Triumph Supercover Sticker. 4". British Leyland Austin Rover Helmet Stickers. 4" or 6" Pair. British Leyland Austin Rover Helmet Stickers. 9" Pair. British Leyland Black & Clear Chequered Flag Stickers. 2" or 3" Pair. British Leyland Black & White Chequered Flag Sticker Static Cling. 3.5". British Leyland Blue & Red Helmet Stickers. 10.5" Pair. British Leyland Car Sticker. 6". 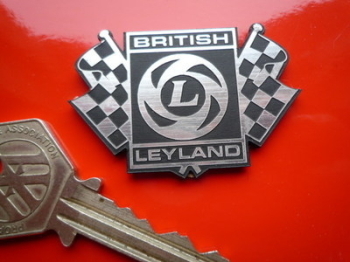 British Leyland Chequered Flag Silver Stickers. 3" Pair. British Leyland Chequered Flag Stickers with Black Text. 6" Pair. British Leyland Chequered Flag Stickers. 3" or 6" Pair. British Leyland Chequered Flags Style Laser Cut Magnet. 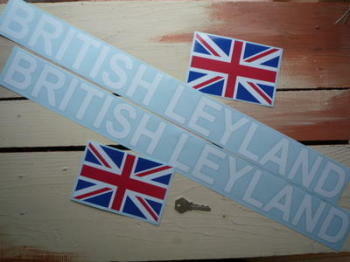 1.75"
British Leyland Circular 'L' Logo Blue & Silver Stickers. 70mm or 80mm Pair. British Leyland Circular 'L' Logo Blue, Silver & Black Coach line Stickers. 3" Pair. British Leyland Circular 'L' Logo Silver & Black Coach line Stickers. 60mm Pair. British Leyland Circular 'L' Logo Stickers. 4" or 6.5" Pair. 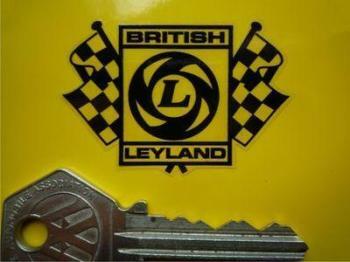 British Leyland Cut Out Logo Sticker. 3", 4", 5", 6", 7" or 8". 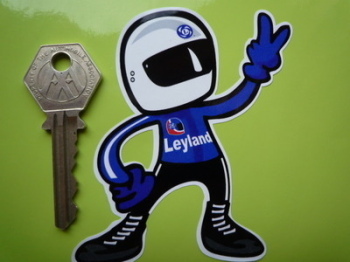 British Leyland Cut Out Square 'L' Logo Sticker. 5". British Leyland Cut Text & Union Jack Stickers. 26" + 6" Pair. British Leyland Cut Text Stickers. 12" Pair. British Leyland Cut Text Stickers. 26" Pair. British Leyland Driver 2 Fingered Salute Sticker. 3.5". British Leyland L 'Next Service Due' Service Sticker. 3". 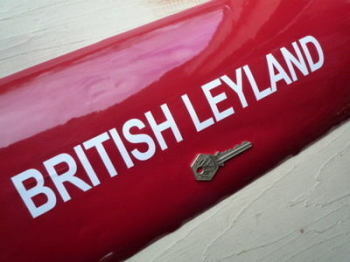 British Leyland L Oblong Stickers. 12" Pair.